Friends Of Football The Camberwell Grammar School Friends of Football is a parent body that has been established to support aspects of the schoolâ&#x20AC;&#x2122;s football program. 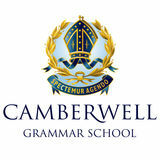 Through social and fund-raising events, it hopes to provide opportunities for further interaction amongst the players and their supporters and to raise the profile of School football within and beyond Camberwell Grammar School community. A committee will be formed each year comprising representatives from each year level. The committee work with school staff to organise the Jumper Presentation function at the start of the season and the Presentation evening at the end of the season.